Click the "Agent Settings" in the "Settings" menu to start the Agent Property Setting. Alternatively, double click an agent in the agent list. Click the "File/Data Security" tab. 1. 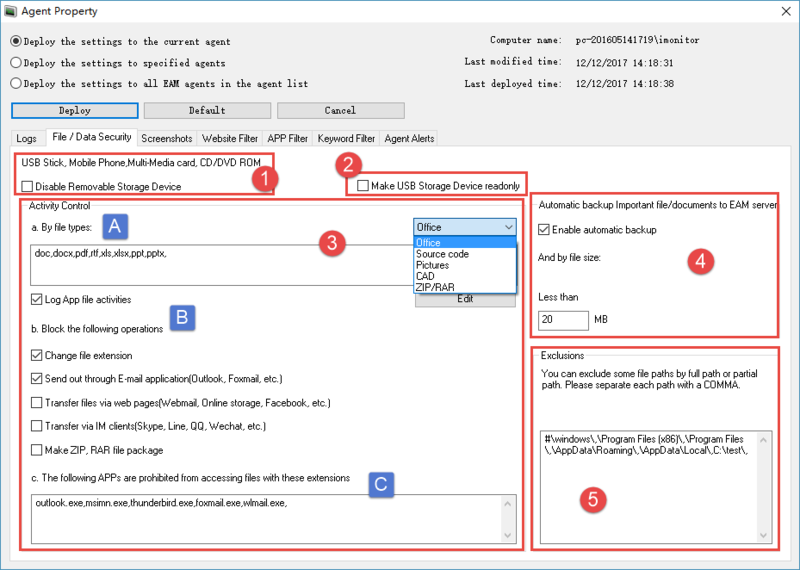 Tick the "Disable Removable Storage Device" check-box to disable removable storage devices. 2. Tick the "Make USB Storage Device readonly" check-box to make USB device as read only. a. Log specific file operations by file types: Click drop-down menu to select file type, or input the file extensions and separate each extend file name with a coma. Such as doc, pdf, xls, jpg, etc..
b. Log application file operations: Input keyword and separate each keyword with a comma. Such as contract, quote, confidential, etc. Click "Edit" to input the application names. 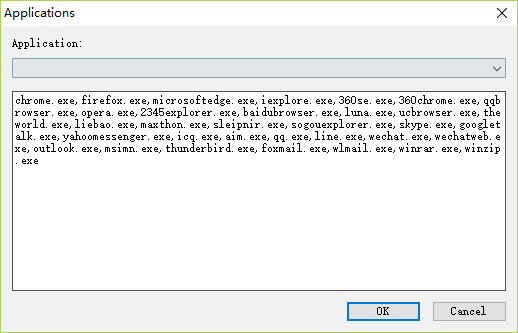 c. Prohibited application list: Input file extension names and separate each extension name with a comma. Such as outlook.exe, foxmail.exe, etc. 4. Tick the "Enable automatic backup" check box. Set the maximum of file size. 5. Input file paths and separate each path with a comma.